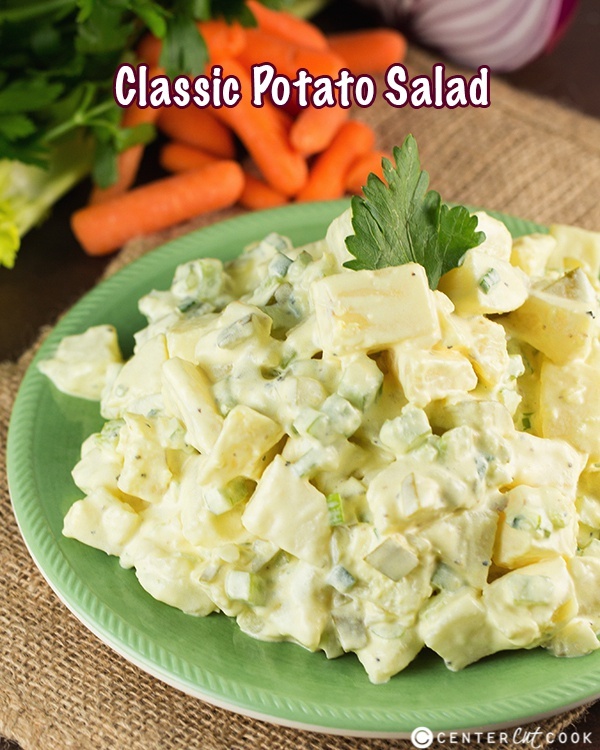 Classic Potato Salad made with or without egg. The key ingredient to this potato salad is the Hellmann’s mayo with just a little bit of mustard mixed in. 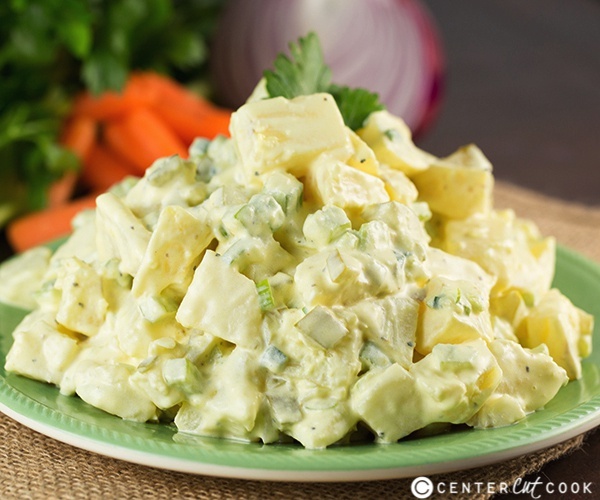 Perfect for potlucks and picnics, this is the Potato Salad recipe you’ll be asked to make over and over! Everybody needs a good trusty classic potato salad recipe, you know, the one you bring to every summer party and picnic? This is a simple recipe that comes together pretty quickly with just a few ingredients. There’s no fancy bacon or cheese in this one; just potatoes, some diced veggies, and the dressing. The key to a good dressing, in my opinion, is Hellman’s mayo with just a little bit of mustard mixed in. I grew up with Miracle Whip but the taste is quite a bit different. Grab the Hellman’s mayo! Raise your hand if you belong in the “I love eggs in my potato salad” club. In case you are wondering, my hand is not raised. I definitely do not enjoy eggs in my potato salad, but definitely add them in if that’s your thing. Just hard boil a few eggs, allow them to cool completely, slice ‘em up and arrange them on the top of the potato salad. Growing up, my mom always sprinkled a little paprika on the top of her potato salad. I had every intention of doing that with this recipe but I completely forgot! The paprika doesn’t add much in terms of flavor, but the little speckles of red make this potato salad pop with a little color! I like to add chopped celery and dill pickles, along with a little green onion to my potato salad. 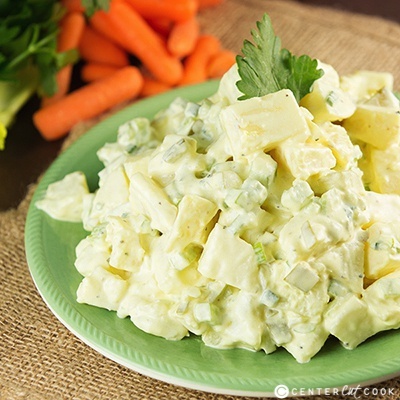 Potato salad isn’t potato salad, to me, unless it’s got the chopped up dill pickles! Serve this with your favorite burgers like these Juicy Mini Burgers! Enjoy! Cover the potato chunks with water, and bring to a boil over medium-high heat. Reduce heat to medium and simmer until the potatoes are fork-tender, about 10-15 minutes. Drain the potatoes and allow them to cool completely (I put them in the fridge to speed the process along). In a large bowl, combine mayo, mustard, apple cider vinegar, salt, black pepper, garlic powder and sugar. Stir well. Toss the cooled potatoes with chopped dill pickles, celery and green onions. Pour the dressing mixture over the potato mixture and stir to combine. If you wish, top the potato salad with chopped hard boiled eggs. Sprinkle a dash of paprika over the top of the potato salad for garnish.